Cane Toads in East Timor?? 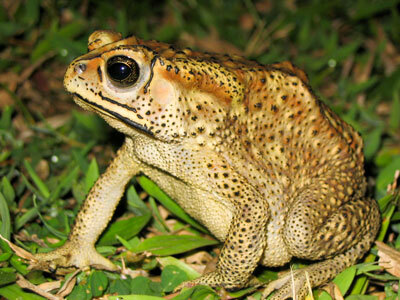 CANE TOADS IN EAST TIMOR? Inaccurate media reports claimed Cane Toads were introduced to East Timor by the Australian Army. You can’t believe everything you see in the public media! Journalists are busy people, and they often don’t have time to check the facts before they run the story. But the problem of unreliable information and exaggeration seems to be worse with stories about cane toads than almost any other topic we’ve encountered – toads attract misleading stories like cowpats attract flies! 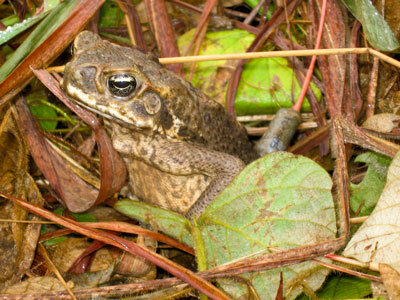 There was a classic example of this situation in September 2008, with reports that cane toads have invaded the island of East Timor, having appeared a few years ago. Some of the locals called the toads “INTERFET Frogs”, and blamed Australian army personnel (part of the UN’s INTERFET force that was sent to East Timor in 1999 to help control violence) for accidentally (or intentionally) bringing the toads from Australia to East Timor. The toads were blamed for widespread ecological catastrophe, for killing off many of the islander’s chickens, and even for lethally poisoning a couple of local people. Despite the lack of evidence, the story was too good to pass up. Did well-intentioned soldiers trying to help the East Timorese actually create ecological havoc by introducing cane toads? This irony made the story attractive to the public, and resulted in a lot of publicity. Some of the well-known Aussie toad “experts” were interviewed on TV and the radio, predicting doom and gloom for the unfortunate island nation. Australian federal politicians, and their East Timorese counterparts, were interviewed at length also. Environmental groups (both in Oz and east Timor) suggested that Australia should pay compensation to the East Timorese for introducing the toad, and should play a role in trying to control the invader’s numbers. To scientists like the members of Team Bufo, the whole story seemed very flimsy – people were getting terribly excited about it all, but where was the evidence? Some of the specific bits of “information” seemed difficult to believe. For example, take the story about all the chickens dying. The same story was spread around Australia in 1936, just after cane toads were released in Queensland – and the sugarcane scientists involved went to the trouble of feeding cane toads to domestic chickens. They soon found that chickens (like most birds) tolerate the toads’ poisons really well. Christa Beckmann, one of Team Bufo’s graduate students, has been repeating those trials recently – and has found a similarly high tolerance. One of Christa’s chickens happily gobbled down over 50 young toads in a single meal! So the notion of cane toads wiping out Timorese chickens, although it got a lot of publicity, sounds like bufobabble to us. 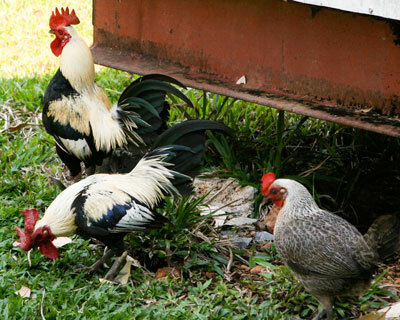 Domestic chickens tolerate the cane toad’s poison and so, a hungry chicken can consume many small toads at a single meal. And how about the story that two Timorese people had died from eating cane toads? Well, it’s certainly possible – the toads have very powerful poisons. But in the extensive history of cane toads being brought to countries all over the world, we only know of two well-documented cases of people dying from eating toads or their eggs. One was in the Philippines in 1941, when the Chief of Detectives in Iloilo Province died after a meal of three toads mistaken for edible frogs. The other case was in Peru, when a woman and her young daughter died after eating a soup made from toad eggs. There was another famous near-fatal case at the University of Sydney many years ago – in the 1960’s we think – when a first-year student accepted a bet from his mates to eat a small part of a cane toad they were dissecting at a biology laboratory class. He won the bet, but was hospitalized in the process. Given the very small number of reliable records of human fatalities from eating cane toads worldwide over many decades, it would be awful indeed if two people in East Timor died within the first few years after toad arrival. We can’t be sure, but it sounds a bit like a myth – especially since it came from the same source as the “chickens are dying” story. There was one other bit of crucial evidence that was yet to be seen – that is, proof that there were indeed cane toads in East Timor! The story was all based on identification by local environmentalists, who weren’t trained in identifying frogs – and frankly, many toads and frogs look very alike. So it’s a bit sad that all the media hoopla took place before anybody actually tried to check what species of frog was being talked about. Rick finally got sent photographs of the Timorese “cane toads” and sure enough, they weren’t cane toads at all! There is another toad species – the black-spined toad, Bufo melanostictus, an Asian species- that has been spreading through Indonesia for the last few decades. It has reached Bali, Irian Jaya (West Papua) and Flores over that period, and it would be expected to have reached Timor as well. Sure enough, that’s the species that was the subject of every “cane toad” photograph that Rick was sent from East Timor. So – the only toads so far known to occur in East Timor belong to an Asian species that has spread from other parts of Indonesia … and it certainly doesn’t sound like the Australian army has anything to apologise for. The story of the Australian troops bringing cane toads to East Timor, and thus creating havoc for poultry and people, was a great yarn – but so far as we can tell, it was pure fiction. It’s an important cautionary tale about how willing we are to believe media stories based on the flimsiest of evidence. And also, it suggests that we should be skeptical about media stories – for example, about toad impact and control - that sound too good to be true. They may well just be figments of somebody’s overactive imagination. Scientists are often accused of being boring or negative when they don’t want to accept so-called “facts” without seeing the evidence – but cases like the “cane toads in East Timor” and the "toad eating frogs" remind us that popular stories about toads are often inaccurate, and it’s worth finding out what’s really going on before accepting such stories at face value.